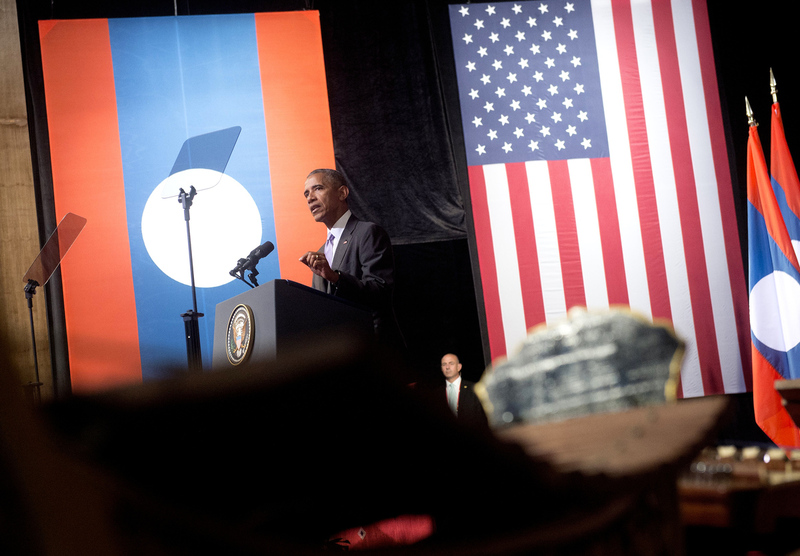 Obama Pledges To Help 'Heal' Laos, Decades After U.S. Bombings : Parallels In a historic visit, the president pledges to double funding to clear the many unexploded bombs that are leftovers from the Vietnam War. President Obama announced on Tuesday in Laos that the U.S. will provide additional assistance to help remove unexploded bombs dropped by the U.S. during the Vietnam War. "Given our history here, I believe the United States has a moral obligation to help Laos heal," Obama said. Laos has a grim claim to fame, as the most heavily bombed country in history, per capita. And today, more than four decades after the U.S. dropped those armaments, millions of unexploded bombs remain. President Obama on Tuesday became the first sitting U.S. president to visit the small, communist Southeast Asian country and promised to double U.S. funding to help educate residents about the dangers and clear the bombs that remain in the ground. "Given our history here, I believe the United States has a moral obligation to help Laos heal," Obama said in announcing a $90 million U.S. commitment over three years. 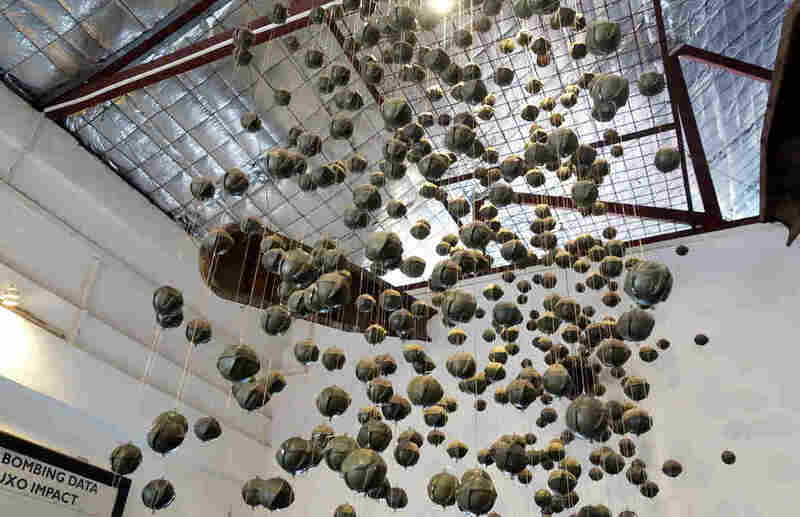 In an exhibit in downtown Vientiane, dozens and dozens of round "bombies" — as the Laotians call them — each the size of a tennis ball, hang from the ceiling like necklaces. Bombies are submunitions; they eject from larger cluster bombs used in airstrikes. They are vestiges of the Vietnam War, which spread to Laos and still plagues the country to this day. "Until now still, [Laotians] are being injured by the bombs," says Baosavanh Vetsaboun, a staffer at the nonprofit COPE, which puts on this exhibit and assists those who lose limbs to unexploded ordnance, or UXO. 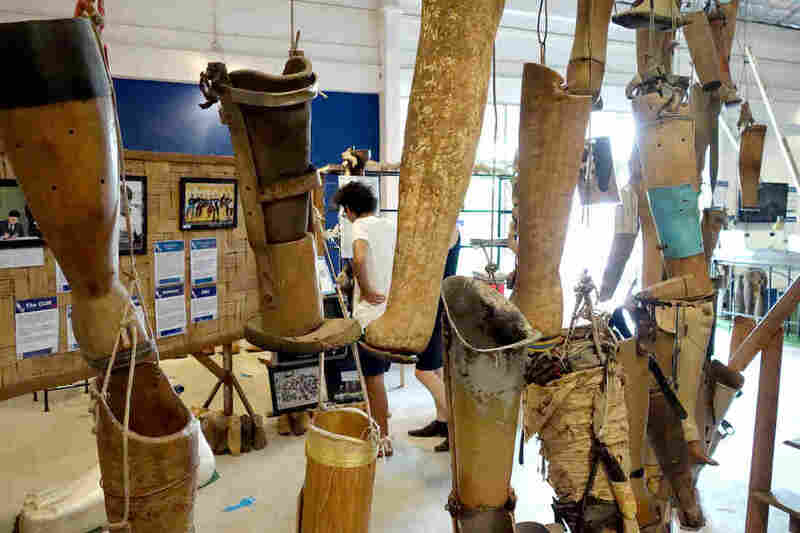 The other side of this hall displays a mountain of makeshift prosthetic legs, some of them clearly just rudimentary pieces of sanded wood, that bombing survivors donated after use. It's part of a costly and deadly legacy of America's "secret war" in Laos. The somewhat secret campaign of bombing raids between 1964 and 1973 made Laos the most heavily bombed country on earth. The U.S. directed much of its firepower at the Ho Chi Minh Trail, which North Vietnamese fighters used to infiltrate the South, by way of Laos and Cambodia. American warplanes dropped an average of one bomb-load every eight minutes, 24 hours a day. They killed more than a quarter million Lao. But an estimated 30 percent of the U.S. bombs failed to explode. So now, some 40 years later — the leftover bombs still lead to about 40 casualties a year. 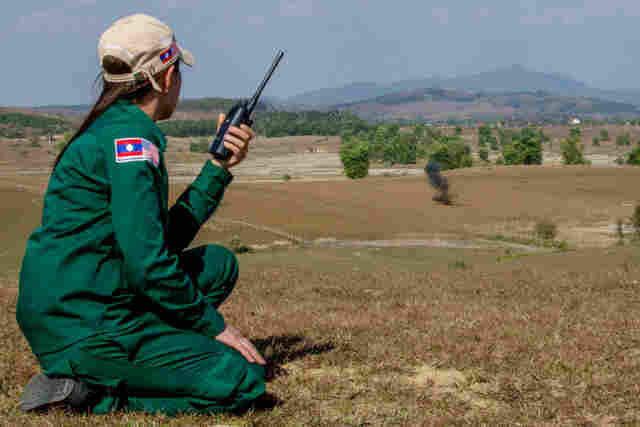 "All it takes is heat, shock and friction for something to be volatile and go boom," says Emma Atkinson, who works on U.S. State Department programs and funding to clear unexploded bombs in Laos. "So when you think about the fact these things were dropped from the air, they've experienced all those things, not to mention the fact they've been sitting in the ground 40 years, deteriorating, which makes them even more volatile," she adds. The U.S. assistance will go to groups like Mines Advisory Group, or MAG international, a nonprofit dedicated to educating people about the bombs and helping them safely destroy the weapons. "Every day our teams are out conducting clearance," says Simon Rhea, the country director. In fields across Xieng Khouang province, MAG technicians root out the bombs and carry out controlled detonations to "destroy the bombies, to make these areas farmable and safe again," says Rhea. "If you speak to any parents there, they would say their biggest fear is about their children being involved in accidents." At the country's National Cultural Hall over the weekend, young Lao trickled in to pick up free tickets to see Obama, who spoke to more than a thousand Laotians here. One of them was Maiyer Thao, age 15. I asked her about the difficult history between the U.S. and Laos. "I don't know about other people, but I think the past is the past," she said. Xaisongkham Induangchanthy contributed to this story.